I’ve mentioned a few times already that one of my main running goals for 2014 is to run a marathon in sub 3 hours. It’s something I’ve got close to before, my PB is 3:05 for the marathon but this year I really am motivated to get under the 3 hour mark. How hard is running sub 3 anyway? If you look at the elites, doesn’t look that hard. 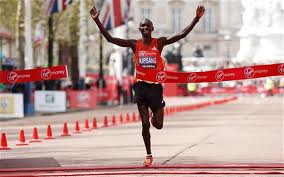 In September 2013 Kenyan Wilson Kipsang ran the Berlin Marathon in 2:03:23 and broke the world record. For those interested that’s 2:55 min/km or 4:43 min/mile or better than 20Km/hr. Go and put your Garmin on and see how long you can hold that pace for. That’s seriously fast running and a long way under 3 hours. But most of us don’t run like Wilson Kipsang. And for us mere mortals running sub 3 is a really big achievement. According to marathonguide.com in 2011 505,238 people finished a marathon in the US, 9094 went sub 3 hours. That’s 1.8% of marathon finishers and that includes the Wilson Kipsang’s and other elites of this world. Sounds Impressive. To run a sub 3 hour marathon you need to average 4:16 min/km or 6:52 min/mile. Coming from Australia we only speak of splits in Kilometres so 4:16 min/Km over 42.195Km. Only 1.8% of US marathoners can achieve this because running a marathon is hard and running a sub 3 hour marathon is really hard. It takes a dedication and commitment to training and following a strict schedule to achieve these goals. Although I am only in week one of my 13 week marathon training, I am motivated and dedicated to running my best in my marathons this year. I am focussed on giving my best each week in my long runs, hill repeats, speed work and tempo runs and winding back and enjoying my easy days and letting the body recover and absorb the hard training. For my long runs I am aiming to finish the last 20 min of each run at goal pace of 4:16 min/km and letting my fatigued body learn how to deal with sub 3 hour pace. I hope this approach to my training will be successful for me on race day. I might never challenge Wilson Kipsang for a marathon title but if I can get under 3 hours I’ll be just as satisfied as he was in September 2013 in Berlin. This entry was posted in Running and tagged marathon, marathon training, running. Bookmark the permalink. I think you’re approach towards your goal is perfect. And considering your PB is 3:05, sub 3 is feasible. Thanks. I’m confident I can get there.